Why did I receive a Facebook "Approved Ad" Email? 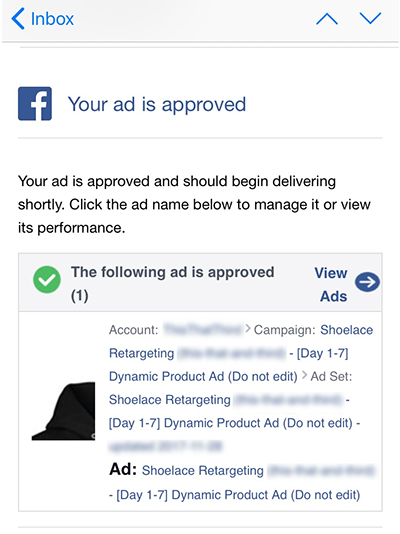 "You ad is approved and should begin delivering shortly"
Did you receive an email or notification from Facebook that your new ad is approved and running - but you didn't actually set it to live yet? This is because Facebook assumes that every ad created is set to live. Facebook then sends an email saying that the ad is live right after they review and approve it. This happens for every single ad we create (even the ones Shoelace created but is re-adjusting before sending out). But here’s the good news: Getting this email that says your ad is live doesn’t actually mean that your ad is running. Just that it is approved by Facebook now and ready to be set live! In fact, no Shoelace ads start running unless you hit “Start” on your campaign proposal.